Продолжаем делать ростовые цветы своими руками. И сегодня, в третьей части видео мастер-класса \"ростовой ранункулюс из изолона и фоамирана\", мы сделаем чашелистик и листья. Hi everyone! With you Catherine and Obustroeno Today we will finish our ranunculus Sepals are droplet-shaped. I have a length of 23 cm Width - 12.5 cm You can make 12 cm. 2 mm EVA foam Circle and cut. 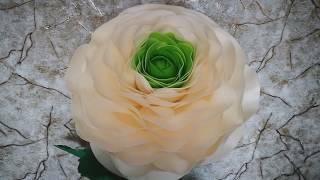 You can cut in 2 layers I have 2 ranunculus Therefore, I will immediately cut 2 sepals. The next stage is toning. He is optional But I'm a little toned sepal. I want to mute the bright green color a little If you have a different shade of green, you may not need to tint. Already a little more pleasant shade I like this option more Now we will give shape to our sepals Heat the top. Collect the accordion-shaped leaf And twist, but not much One way and the other Warming up at the bottom. And hold your finger to appear volume. These are the sepals should get When gluing the convex part will be the top And so neatly they will fall on the ranunculus Glue the sepal with a hot gun Sticking so that he covered a little the pipe Then we wrap the pipe with tape.. I pasted about 3 cm. From base to sepal. If you want the leaves to look like real ranunculus leaves. They should have this form of legs with long fingers I cut out 2 options They have a long enough leg If you make them from 2 mm EVA foam, the leaves will not keep the shape. Therefore, on the wrong side will have to glue the wire. That she held the paws and legs. This should be done if you want to make really similar leaves.. If you want to make just leaflets - do I will do like this. Yes, it will be long. In addition, there will be many such leaves.. I will do in 2 sizes Circle and Cut Out. We take the wire in PVC winding 1,5 And cut into pieces, depending on how many "legs" we need to support. Here we will have one foot We will fix it with wire The second Such a construction will be glued on the reverse side of the leaflet. So the leaf will keep the shape Now the wire needs to be wrapped with 1 mm EVA foam..
You can use 2 mm EVA foam But thinning it is quite difficult.. Therefore it is better to use 1 mm. But if you take 2 mm EVA foam, you can completely get into the color of the leaves. Clay on Cosmofen Making a beautiful ending. Do not forget to constantly apply glue so that the winding does not slip..
That's the way we glue Now we are harvesting 2 more wires I twisted the wires together And wrapped foot with EVA foam Now you need to glue the frame to the leaflet.. It would be easier to glue the wire and glue it on top with a strip of EVA foam.. But this option seems to me more accurate. In the lower part we wrap a leaflet in EVA foam..
And form the leg She will be thick enough. Similarly, we collect the remaining leaves And insert them into the stalk The stalk will be a metal-plastic tube 20 wrapped with tape.